For each unit of damage Cao Cao receives, he can draw one card from every character. He then flips his character card. Cao Cao always has a bonus +1 horse. If Cao Cao activates "Tribute" when he is flipped face down, he can draw one card from each character then flip his character card to the upright position. "Tribute" activates on a 'per-damage' basis. For example, if Cao Cao receives two units of damage in one instance, he takes one card from each character, flips his character card face down, then takes another card from each character and flip back face up. "Tribute" allows Cao Cao to take any type of card from each character. He can take a hand card, an equipped card, or even a pending judgement card. "Flying Shadow" gives Cao Cao the same benefit of that of a +1 horse. Cao Cao can equip an additional +1 horse and gain a total physical bonus of +2. "Tribute" is very powerful in games with many players. In many cases, it is in Cao Cao's advantage to become damaged so he can take a card from each character. Cao Cao has a very good chance of finding a Peach when he uses this ability. Additionally, the fact that Cao Cao can flip back face up when he is face down makes this ability even more possible. Cao Cao is very strong with the Crossbow because he has a good chance of getting many Attack cards from "Tribute." Additionally, he can use this ability to acquire this weapon if another character has this weapon equipped. "Flying Shadow" is useful against enemies who want to use Steal against Cao Cao as it makes it harder for them to reach him. Cao Cao's two abilities do not work well together. Enemies will not want to try to damage Cao Cao so he cannot activate "Tribute." "Flying Shadow" makes it more difficult for allies to reach Cao Cao with an Attack. Cao Cao is particularly weak to Capture. 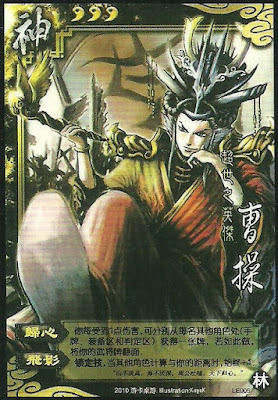 While "Tribute" gives Cao Cao a good chance of acquiring a Negate, if he does not have this card, he will likely lose most or all of the cards he acquired from "Tribute." Cao Cao becomes weaker and weaker as characters die. With fewer characters, Cao Cao's "Tribute" is weaker and provides him with fewer cards. In a one-on-one situation, Cao Cao is incredibly weak and "Tribute" is often not worth using. Cao Pi - Cao Pi's "Exile" allows him to flip Cao Cao face up if he is face down after using "Tribute." This allows him to play more quickly. Zhang Hong & Zhang Zhao/Cao Zhi - These characters have abilities that allow them to pick up cards that are discarded in other characters' discard phases. They can benefit greatly from Cao Cao's discard phases as he can acquire many cards from "Tribute." This is good if they are on Cao Cao's side, but they can put Cao Cao at somewhat of a disadvantage if they are on the opposite team. 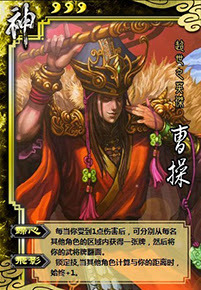 SP Diao Chan - SP Diao Chan is Cao Cao's worst enemy. She can use "Soul Surrender" to steal all of the cards he gains from "Tribute" and use them against him and his allies. Zhang Chun Hua - Zhang Chun Hua's "Unfeeling" allows her to damage Cao Cao freely without activating "Tribute." Da Qiao - Da Qiao's "Country Scene" makes it easy for her to Capture Cao Cao and force him to waste all of the cards he gained from "Tribute." King Cao Cao is an outstanding king choice, especially if there are many players. The rebels are put in a dilemma. They must damage Cao Cao to kill him, but doing so will activate "Tribute." They will probably not stand a chance unless they kill the loyalists and spy first. The developers of QSanGuoSha felt that Cao Cao was too powerful as the king and forbid players to use him in this role. Loyalist Cao Cao is a very good loyalist. So long as there are several rebels, "Tribute" is very powerful. Rebel Cao Cao is a very good rebel. "Tribute" allows him to obtain several cards in a short amount of time. He can take a critical piece of equipment from the king and use the many cards he acquires from this ability against him. Spy Cao Cao is a good spy, but he must be careful in this role. As characters die, his "Tribute" becomes less and less powerful. Cao Cao's top priority should be to acquire the Crossbow. He should try to kill the last few characters during his turn and try to avoid a one-on-one battle with the king. Cao Cao is probably the best demigod character in San Guo Sha. "Tribute" is incredibly powerful. When other players use Barbarians or Hail of Arrows, it is often best to take damage to activate this ability. Whenever possible, keep and store Negates to use on Capture. If you have a Blaze card, do not forget that you can use it on yourself during your turn to activate Tribute and take a card from each character. It is best to do this if you have a way of healing yourself. If you are on the opposite team of Cao Cao, the best way to deal with him is to simply ignore him. If he cannot activate "Tribute," there is nothing that he can do to cause a great deal of harm to your team. If he is a character that you must kill to win the game, focus on killing all of his allies first. Deal with him late in the game when "Tribute" is not as powerful.